Mark 13 [7.] “When you hear of wars and rumors of wars, don’t be troubled. For those must happen, but the end is not yet. For nation will rise against nation, and kingdom against kingdom. There will be earthquakes in various places. There will be famines and troubles. These things are the beginning of birth pains. But watch yourselves, for they will deliver you up to councils. You will be beaten in synagogues. You will stand before rulers and kings for my sake, for a testimony to them. The Good News must first be preached to all the nations. When they lead you away and deliver you up, don’t be anxious beforehand, or premeditate what you will say, but say whatever will be given you in that hour. 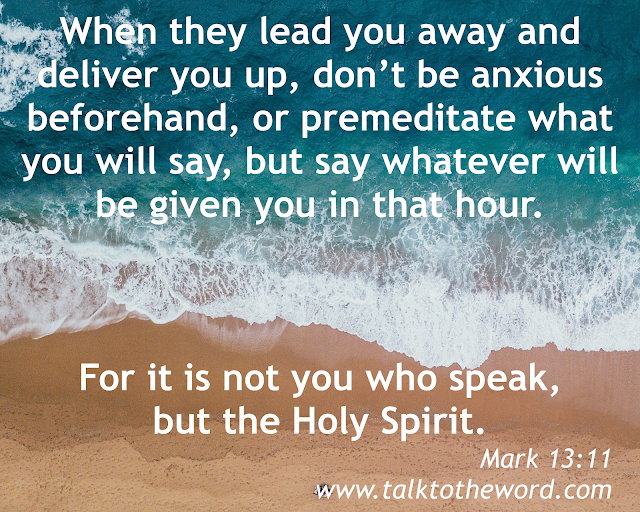 For it is not you who speak, but the Holy Spirit. Mark 13 [12.] “Brother will deliver up brother to death, and the father his child. Children will rise up against parents, and cause them to be put to death. You will be hated by all men for my name’s sake, but he who endures to the end, the same will be saved.